In light of the Fannie Mae / Freddie Mac bailout which has Dow futures up a staggering 230 points we will get an idea as to how much momentum bulls can build in the face of last week's selling. So how did the stockchart.com crew view last week's action? Yong Pan tops the list. 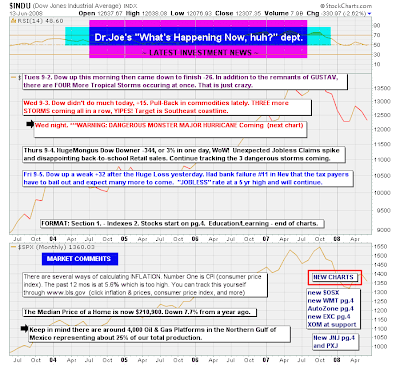 His summary has two new neutral signals and two new bull signals. 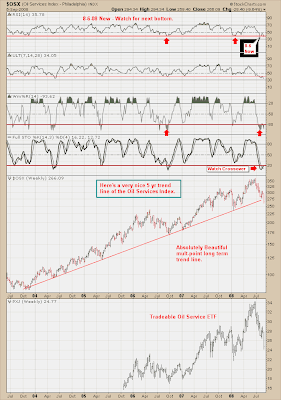 The bearish areas in the market are slowly evaporating. Certainly the bullish stance will pay dividends today (for those lucky to get in on Friday's close. 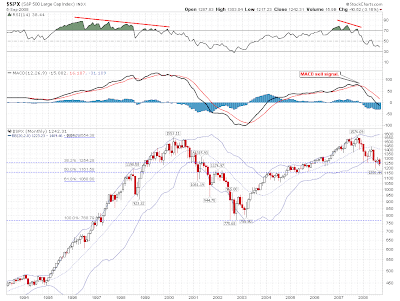 Worrying trend of following along the lower Bollinger Band on the monthly; note failed test of mid-line in May. I have been warning you that September is more and more becoming an extremely volatile month, and this year seems to confirm that. During August, the volume on the daily charts was shrinking, and now in September we have increasing volume revealing distribution. The Aroon on both the DJIA and S&P 500 daily charts have not been supporting the rally. We began to see the Aroon up break below the value of 70 in mid-August, clearly a sign that the Aroon refused to support this rally. I am a big believer in the Aroon, which is a trend finding indicator. 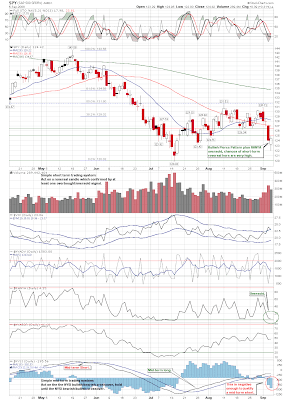 Other bearish signs last week on the S&P 500, was a bearish crossover on the TRIX, the breakdown of the On Balance Volume (OBV) and the RSI trendlines, the full stochastic (14,3,3) turned lower at the value of 50. Moreover, the MACD kept crisscross above and below its signal line in the prior two weeks before the breakdown on the zero line. Finally, the MACD turned lower and plunged into negative territory as price broke support at 1261. 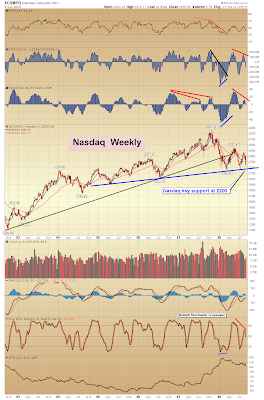 The Nasdaq and QQQQ daily charts broke down from bearish descending triangle patterns. The Qs broke the $46 dollar level of support falling below its intraday low made on July 15 of $43.30 to $42.81. However, prices closed above it at $43.45. With the gap lower on the Naz and the Qs, they could be setting up for a short term reversal in the form of a morning star reversal. If prices jump on Monday and close half way with in the body of the first day, the pattern will be completed (see their daily charts below). The S&P 500 daily chart got a hammer, which could allow it to test resistance at 1261. 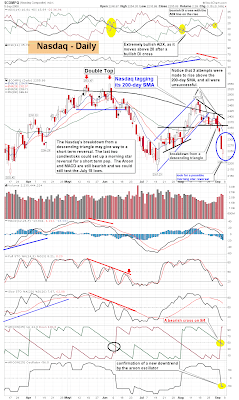 The DJIA and the S&P 500 could be carving out double bottom patterns. But remember double bottoms often see the second bottom move lower than the first in order to shake out weak longs. 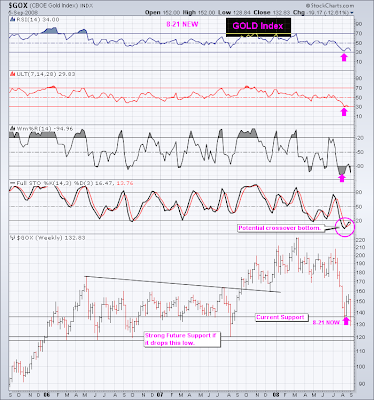 But his CBOE Gold Index doesn't looks good; is there a breakdown or is last week's support break a bear trap? 9/6 -- Having reviewed all the charts, my conclusion is that while we had a reversal bottom on Friday, we have NOT yet broken back to an uptrend. You can see this from almost any short term chart. A spike-up opening on Monday would do it, but I would lean toward the probability that we will sell off again first. The look of the decline on the Dow suggests 4 waves of what may be a 5-wave Elliott decline. That means one more down wave before this leg can truly reverse. 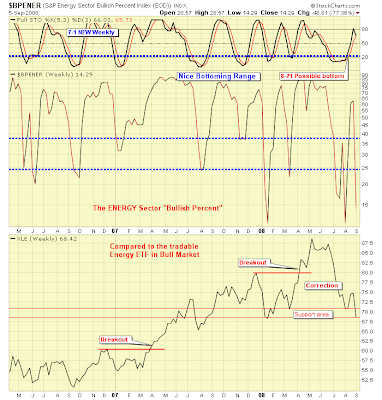 The decline last week is an acceleration of the existing downtrend in most indexes that began a month ago. Unfortunately, new accelerations don't provide an easy target line to shoot for, so they are drawn in as mini channels for now and you have to go with that until a clear break back upward occurs. Then we get to determine whether this turns out to be a longer term bottom. I suspect not, however, with what is going on in the economy on top of noted seasonal influences to the downside for Sep-Oct. Long term charts look bleak, though in March, the Dow did break down like it did this week before starting a long rally upward. There is a huge liquidation going on in hedge funds as they de-lever and as institutions reduce holdings. Articles have confirmed this. That is why holdings like oil & energy are selling off particularly hard. Be careful on Monday as there are likely to be some big gyrations around the nationalization of Freddie Mac and Fannie Mae.